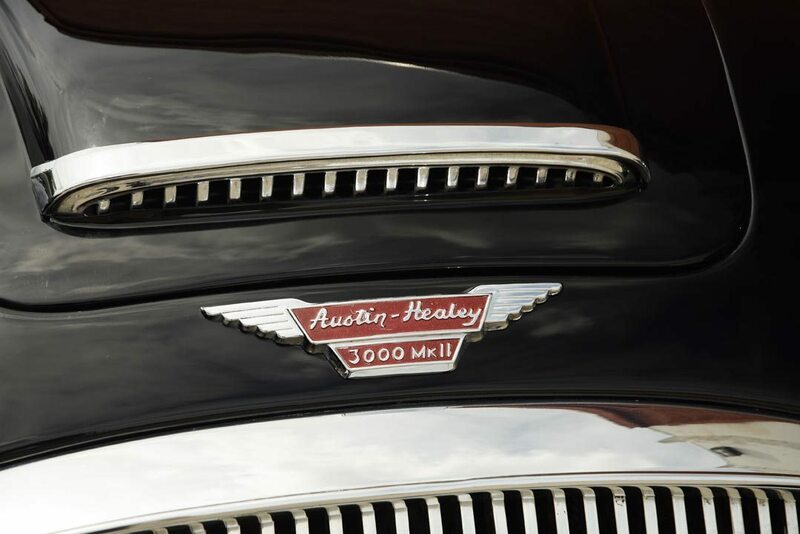 Donald Healey guided the landmark Austin-Healey sports car through 17 years of continuous improvement during the marque’s relatively brief history. From the debut of the first Spartan four-cylinder BN1 in 1952, to the production of the last grand touring BJ8, the world market had certainly changed, and so did Donald Healey’s namesake sports car. The process included more power, a higher level of refinement, and a much improved driving experience. Keeping pace with new technology was a challenge for a small manufacturer, but Healey kept his cars in the forefront by skillfully responding to the market while still maintaining the essence of fine British motoring. The final 2-seat Big Healey, the 1964-1968 3000 Mark III Phase 2 cars as photographed today in Auburn, brought the journey to a fabulous conclusion, powered by a 150hp 3-liter twin carburetor six, a smooth synchro gearbox with overdrive, and a rugged, competent chassis with enhanced ground clearance. Inside, the buying public found far more luxurious appointments, including well-bolstered comfortable seats and a lovely burled wood dashboard that befits the car’s performance. This 1965 Phase 2 has led a remarkable life, with only two owners, both from Muncie, Indiana. Covering just a documented 16,500 miles from new, it is as close as you’ll ever come to brand new Mk III. It is original and virtually untouched throughout, and has survived as a time-capsule of loving ownership, attention, care and preservation. 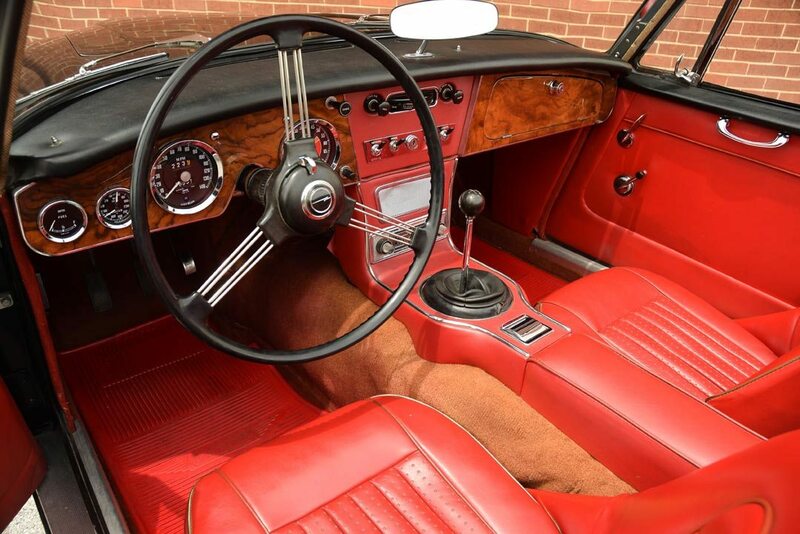 The interior is breathtaking, with beautiful carpets and Healey floormats that are original to the car, and the top boot and tonneau cover are even in their original bags. The car even features the rarely seen and usually lost original tonneau cover stays. 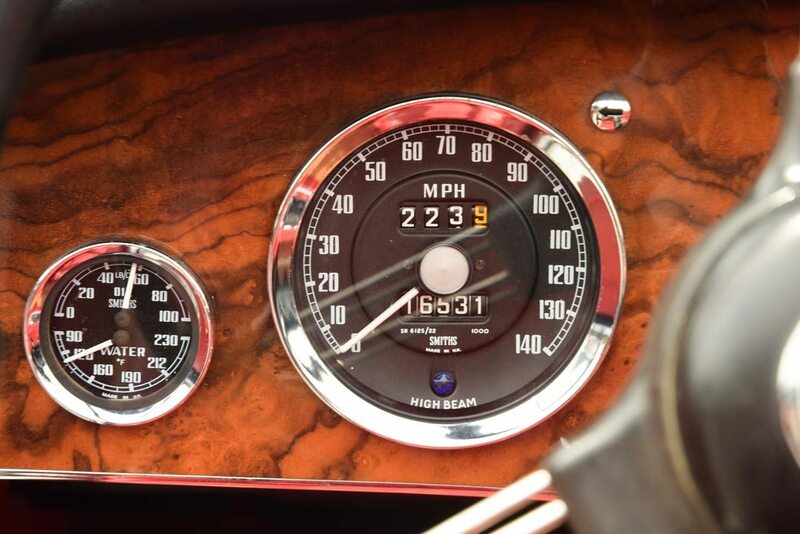 The instruments are clear and clean, the dash is spectacular, and at first glance, most enthusiasts would assume that it has to be a replacement interior, but this car was simply immaculately maintained, not restored. The body shows only the most minor stone chips, but retains a fine shine with no dents or dings we could find. It rides on the original wire wheels with original-style Dunlop Gold Cup bias ply whitewall tires. Make no mistake, the paint on the wire wheels was applied in Birmingham, England fifty years ago. Even the underbody is as it left the factory, untouched and nearly pristine, with a factory-mark crayon ’3′ still adorning the door jams. The sill plates, chrome, and lamps are all in outstanding condition, and even the top looks great and appears to be original to the car. Under the hood, it’s tidy and completely correct, and very presentable despite never being detailed. 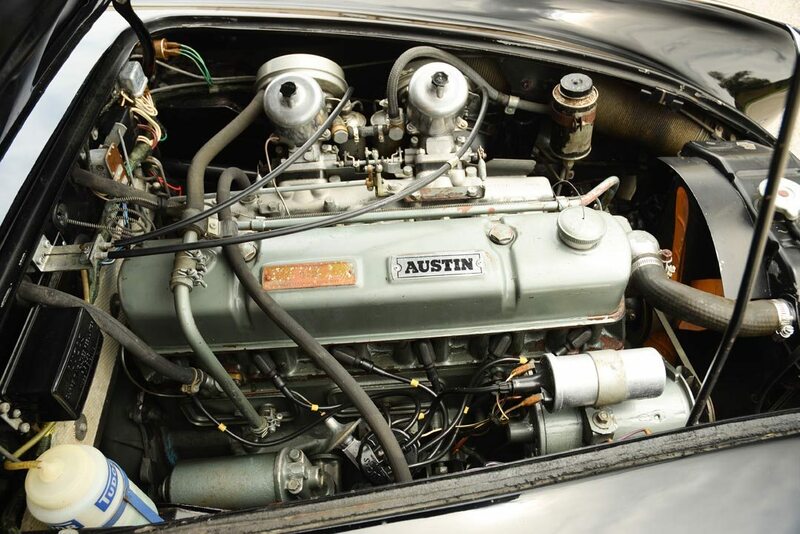 The car should be used as a benchmark for correctly restoring a Healey, as virtually nothing but the fluids and the tires have been changed in 50 years. 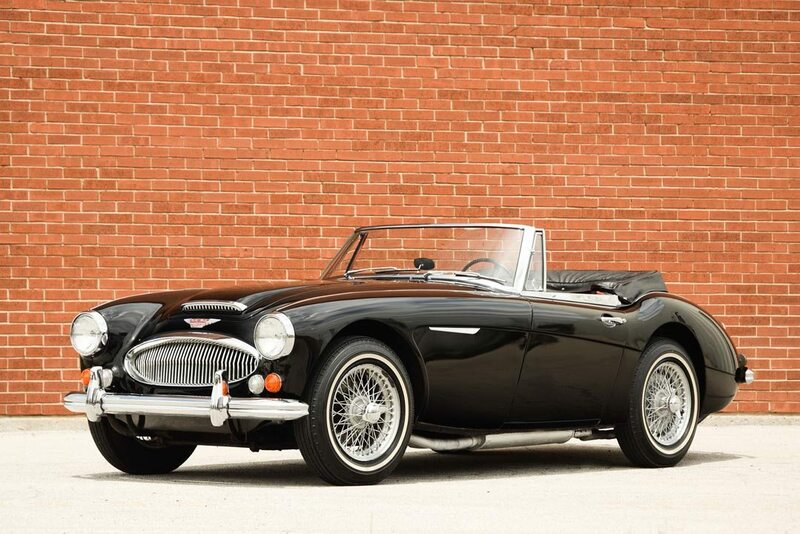 If you were going to choose an Austin-Healey to cherish from new, this car would be your first choice: the final phase 2 iteration of the 3000 Mk III, in a fantastic black and red livery, and a car that has never neglected or abused. Simply one of the fastest, safest, and most comfortable Austin-Healeys ever produced. 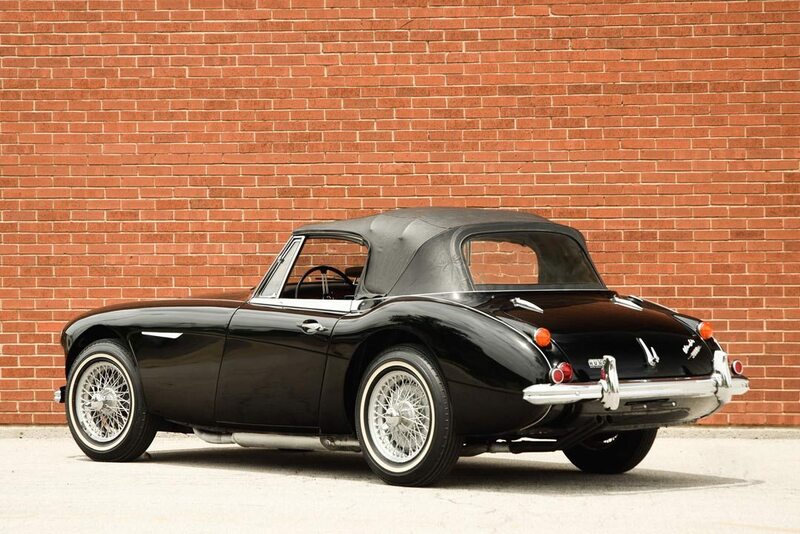 If you have an Austin-Healey or another collectible you’d like to insure with us, let us show you how we are more than just another collector vehicle insurance company. We want to protect your passion! Click below for an online quote, or give us a call at 800.678.5173.